WaxMelters PG40 Gel Candle Melting Tank for melting gels and gel candle making. PG40 Gel Candle Melting Tank for melting gels and gel candle making. 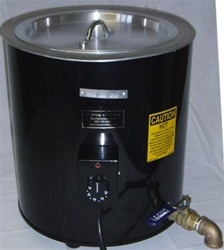 Weight & Mass: Approximately 40lb (18.2kg) capacity for professional candle making waxes. IDEAL FOR MELTING GELS FOR PROFESSIONAL CANDLE MAKING! Simply set it at your desired melting temperature- Melts fast. Melting pots come complete with an EZ 3/4 inch (1.9 cm) male pipe thread dispensing outlet and a 3/4 inch (1.9 cm) female threaded ball valve. Melting pots are cast in aluminum and completely welded to prevent leaking.